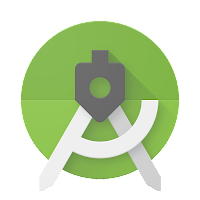 Android Studio 2.2 is available to download today. 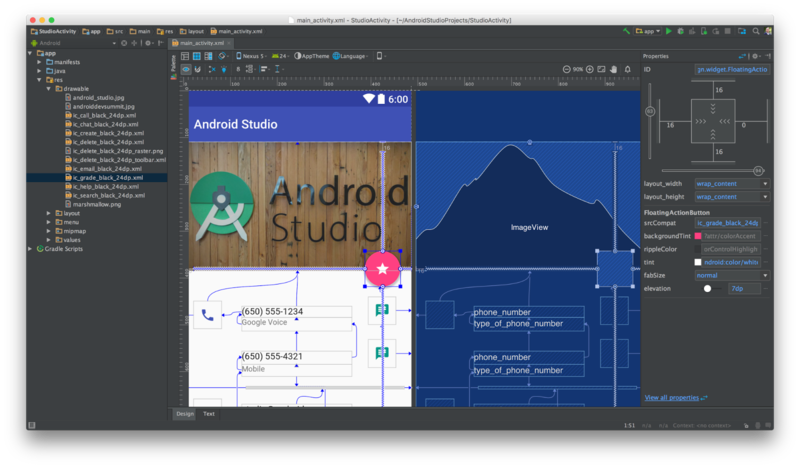 Previewed at Google I/O 2016, Android Studio 2.2 is the latest release of our IDE used by millions of Android developers around the world. Packed with enhancements, this release has three major themes: speed, smarts, and Android platform support. Develop faster with features such as the new Layout Editor, which makes creating an app user interface quick and intuitive. 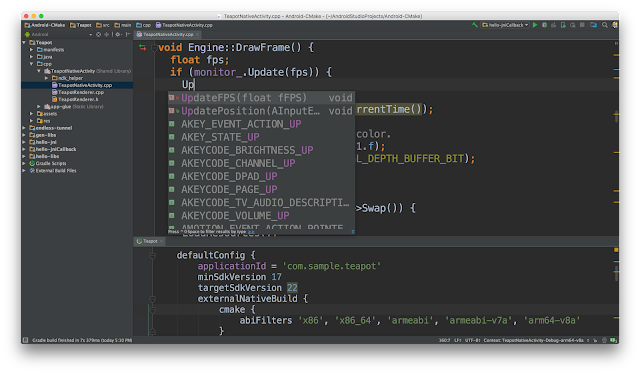 Develop smarter with our new APK analyzer, enhanced Layout Inspector, expanded code analysis, IntelliJ’s 2016.1.3 features and much more. 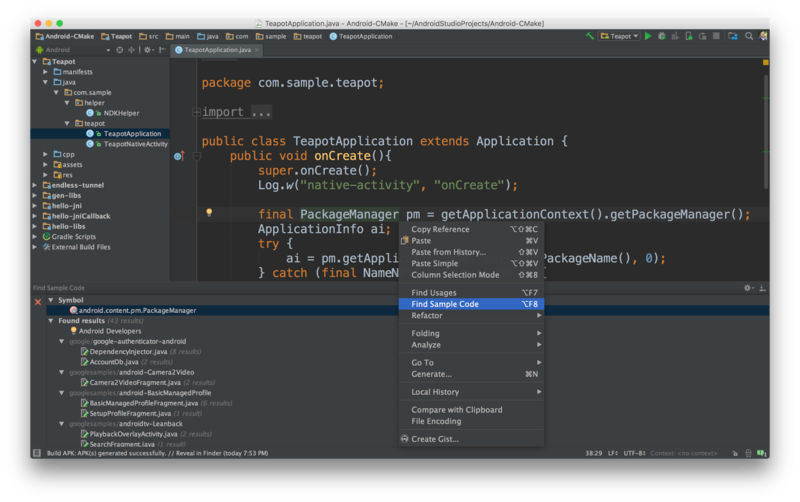 Lastly, as the official IDE for Android app development, Android Studio 2.2 includes support for all the latest developer features in Android 7.0 Nougat, like code completion to help you add Android platform features like Multi-Window support, Quick Settings API, or the redesigned Notifications, and of course, the built-in Android Emulator to test them all out. In this release, we evolved the Android Frameworks and the IDE together to create the Constraint Layout. This powerful new layout manager helps you design large and complex layouts in a flat and streamlined hierarchy. The ConstraintLayout integrates into your app like a standard Android support library, and was built in parallel with the new Layout Editor. Layout Editor: Creating Android app user interfaces is now easier with the new user interface designer. Quickly construct the structure of your app UI with the new blueprint mode and adjust the visual attributes of each widget with new properties panel. Learn more. Constraint Layout: This new layout is a flexible layout manager for your app that allows you to create dynamic user interfaces without nesting multiple layouts. It is backwards compatible all the way back to Android API level 9 (Gingerbread). ConstraintLayout works best with the new Layout Editor in Android Studio 2.2. Learn more. Improved C++ Support: You can now use CMake or ndk-build to compile your C++ projects from Gradle. Migrating projects from CMake build systems to Android Studio is now seamless. You will also find C++ support in the new project wizard in Android Studio, plus a number of bug fixes to the C++ edit and debug experience. Learn more. 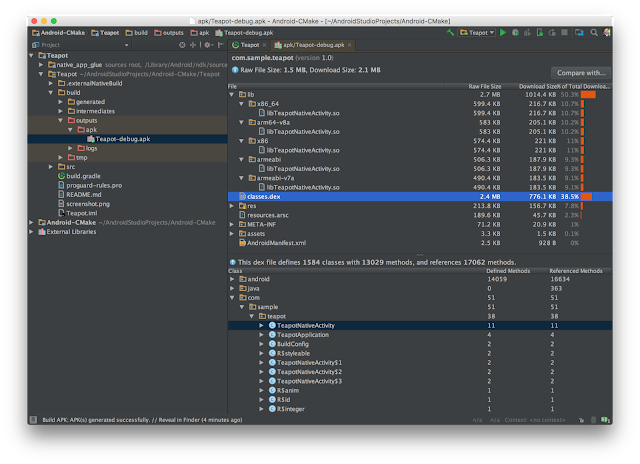 Samples Browser: Referencing Android sample code is now even easier with Android Studio 2.2. Within the code editor window, find occurrences of your app code in Google Android sample code to help jump start your app development. Learn more. 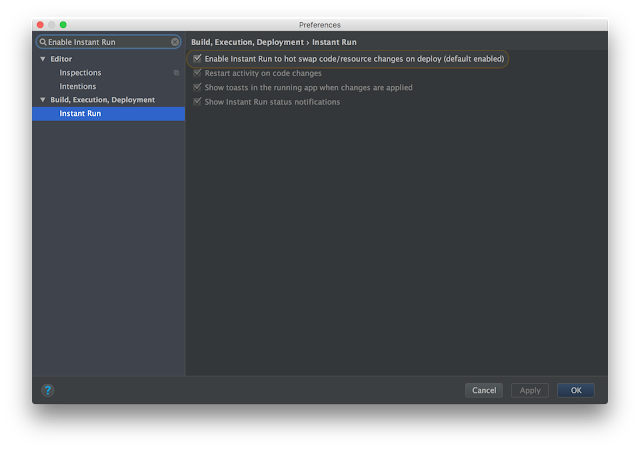 Instant Run Improvements: Introduced in Android Studio 2.0, Instant Run is our major, long-term investment to make Android development as fast and lightweight. 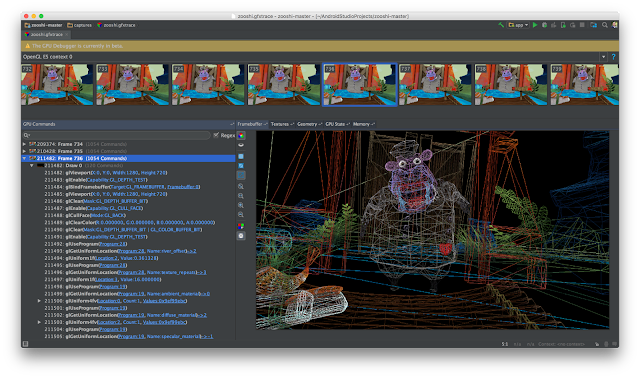 Since launch, it has significantly improved the edit, build, run iteration cycles for many developers. In this release, we have made many stability and reliability improvements to Instant Run. If you have previously disabled Instant Run, we encourage you to re-enable it and let us know if you come across further issues. (Settings → Build, Execution, Deployment → Instant Run [Windows/Linux] , Preferences → Build, Execution, Deployment → Instant Run [OS X]). For details on the fixes that we have made, see the Android Studio 2.2 release notes. APK Analyzer: Easily inspect the contents of your APKs to understand the size contribution of each component. This feature can be helpful when debugging multi-dex issues. Plus, with the APK Analyzer you can compare two versions of an APK. Learn more. Build cache (Experimental): We are continuing our investments to improve build speeds with the introduction of a new experimental build cache that will help reduce both full and incremental build times. Just add android.enableBuildCache=true to your gradle.properties file. Learn more. Virtual Sensors in the Android Emulator: The Android Emulator now includes a new set of virtual sensors controls. With the new UI controls, you can now test Android Sensors such as Accelerometer, Ambient Temperature, Magnetometer and more. Learn more. Espresso Test Recorder (Beta): The Espresso Test Recorder lets you easily create UI tests by recording interactions with your app; it then outputs the UI test code for you. You record your interactions with a device and add assertions to verify UI elements in particular snapshots of your app. Espresso Test Recorder then takes the saved recording and automatically generates a corresponding UI test. You can run the test locally, on your continuous integration server, or using Firebase Test Lab for Android. Learn more. GPU Debugger (Beta): The GPU Debugger is now in Beta. You can now capture a stream of OpenGL ES commands on your Android device and then replay it from inside Android Studio for analysis. You can also fully inspect the GPU state of any given OpenGL ES command to better understand and debug your graphical output. Lean more. 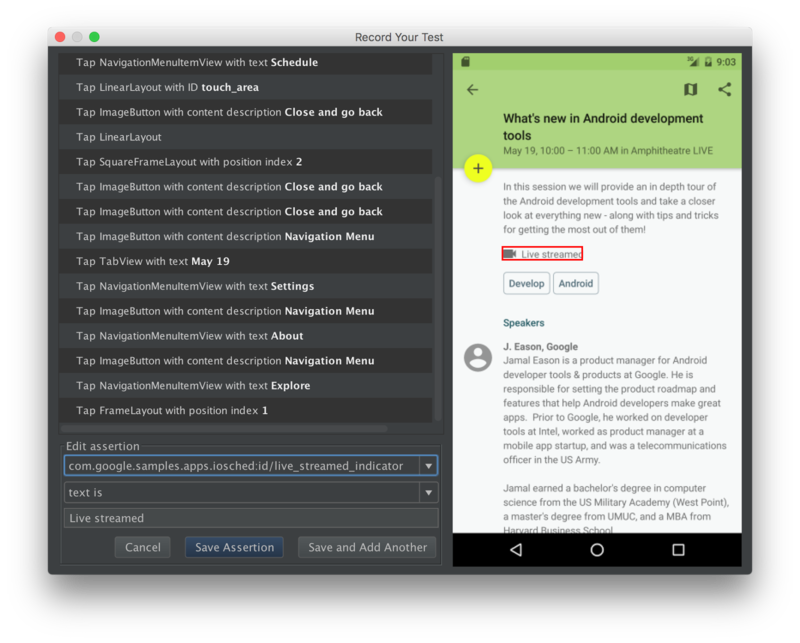 Learn more about Android Studio 2.2 by reviewing the release notes and the preview blog post. If you are using a previous version of Android Studio, you can check for updates on the Stable channel from the navigation menu (Help → Check for Update [Windows/Linux] , Android Studio → Check for Updates [OS X]). You can also download Android Studio 2.2 from the official download page. 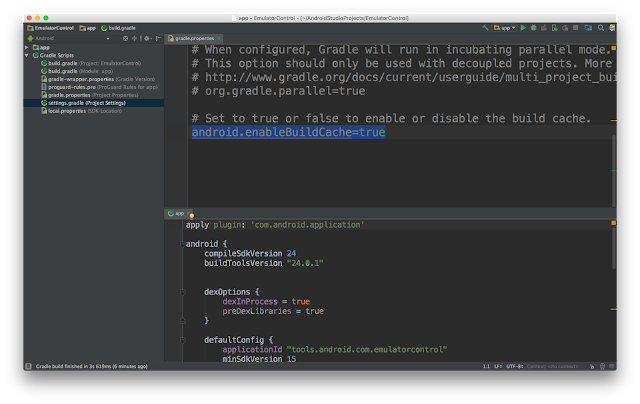 To take advantage of all the new features and improvements in Android Studio, you should also update to the Android Gradle plugin version to 2.2.0 in your current app project. We would like to thank all of you in the Android Developer community for your work on this release. We are grateful for your contributions, your ongoing feedback which inspired the new features in this release, and your highly active use on canary and beta builds filing bugs. We all wanted to make Android Studio 2.2 our best release yet, with many stability and performance fixes in addition to the many new features. For our next release, look for even more; we want to work hard to address feedback and keep driving up quality and stability on existing features to make you productive.